West Vincent Township, lies 20 miles west of Philadelphia, and ten miles east of the Lancaster County-Chester County border. 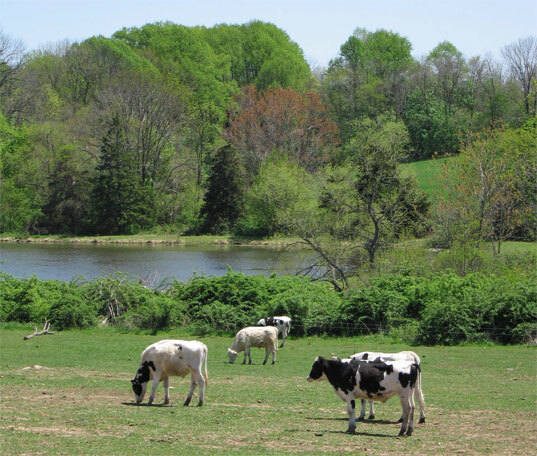 The Township’s TDR program is designed to encourage the preservation of agricultural lands, prime soils, environmentally sensitive resources, open space and views as well as maintain the historic character of the Township. West Vincent Township’s TDR program is designed to save agricultural lands, prime soils, environmentally-sensitive resources, open space, views and historic character. Sending area property owners are allowed to transfer less than a site’s total TDRs as long as the parcel retaining development rights meets the code requirements for lot size and dimensions. The restricted portion of the parcel must contain the parcel’s highest priority resources according to the following descending order of importance: 1) prime soils, 2) land devoted to agricultural use, 3) historic, cultural, scenic resources, 4) flood plain, 5) wetlands and hydric soils and 6) woodlands and slopes greater than 15 percent. To determine TDR allocation to sending parcels, land in three categories is deducted from the Adjusted Tract Acreage: 1) land already precluded from development by easement, 2) the land area needed to comply with minimum lot size for any dwelling units on the property, and 3) 15 percent of the remainder to represent land that would otherwise be devoted to roads and other infrastructure. The result, called the net TDR tract area, is used to calculate the number of TDRs available for transfer. The Township offers a bonus for transferring TDRs rather than building on site. A table in the code sets forth baseline density, bonus density available only by transfer and total maximum that can be transferred with TDR. For example, landowners in the RC district can achieve a maximum density of 0.48 units per acre on site or can transfer 0.60 units per acre with TDR. Similarly in the PRD district, the baseline density allows on site development of 3.0 units per acre but 3.75 units per acre can be transferred by using TDR. Land in seven different zoning districts can qualify as receiving sites: five residential and two non-residential zones. The minimum parcel size for a receiving site varies from 30,000 square feet to 50 acres depending on which of the seven potential zones applies to the site. In the residential receiving zones, a developer can build 2.5 extra dwelling units for each TDR from a sending site zoned RC, 1.75 units per TDR from sending sites in the R-3 zone and 1.25 units for each TDR transferred from a sending site in the R-2 zone. One additional unit is permitted per TDR from sending sites in six other zones. Maximum density permitted via TDR varies from 1 unit per acre in the R-3 zone to 6 units per acre in the Residential Mix zone. In the non-residential zones, each TDR purchased allows a receiving site developer an additional 5,000 square feet of floor area or 75 percent lot coverage per acre, whichever is less. Developments using TDR are also allowed a 10 percent reduction in required greenway or minimum lot size or bulk requirements. The code requires that the County Board of Assessment be notified of all TDR transactions so that proper reassessment can occur. The code also specifies that the Township can buy TDRs either for retirement or for resale. In March 2005, Township Manager Jim Wendelgass reported that three private sector transfers involving roughly 60 TDRs had protected approximately 150 acres of sending area land. Sending area property owners had also preserved an additional 77 acres but had not transferred the resulting 50 TDRs as yet. Finally, the Township had purchased and retired an additional 134 TDRs, preserving an extra 247.4 acres of land.